When I was younger, I was sure I knew everything. Sometimes I still fall back into that mode and then something happens to prove (usually quickly) how stupid that thought is. However, if you’ll let it, experience and age bring wisdom and knowledge that just can’t be taught any other way. That’s the premise for this post. I have been privileged to hire an intern at work. She is young – 18 – and VERY intelligent, but during one of our discussions, her comments reminded me that all the education in the world can’t beat out some good experience when it comes to learning about personal finance. With that in mind, I compiled a list of 10 things I wish someone would have taught me when I was 18 and things I will convey to her – even though they have nothing to do with her assigned job duties. I will admit many of them are not directly about money, but I included them because they had a very powerful impact on my financial life. People will be hired, promoted and paid more than you without good reason. You’ll be wronged, cheated and maybe even hurt. Learn from these experiences and be bettered because of them. I don’t believe in using people to get what you want and people who do that usually destroy relationships. Instead, build strong relationships and then when you get the chance to benefit yourself AND the relationship, take all those opportunities that present themselves. “…for I have learned to be content whatever the circumstances. I know what it is to be in need, and I know what it is to have plenty. I have learned the secret of being content in any and every situation, whether well fed or hungry, whether living in plenty or in want” (Philippians 4:11b-12). When things are going well and when they aren’t, God is still good and each breath we take is one we didn’t have to be granted. I meet too many people who live in a pipe dream. While you should always be dreaming, a good dose of reality is pretty darn important. That’s why I preach so hard about living on a budget – it puts your financial reality on paper and makes you look at it and make choices and priorities. I got my first credit card when I was 18 to “build my credit”. That’s stupid. If you don’t want to go into debt, you don’t need a good credit score. If you pay your expenses on time, live within your means and stay out of trouble, your credit score will take care of itself. If someone judges you solely by your credit score, might I suggest these people are morons? It is like judging someone’s ability to be a good employee by looking ONLY at their high school report card. It may matter, but it probably doesn’t. Less than a year ago, my dad was killed suddenly in a horrible car accident. Want to know the last thing I did with him? I celebrated my daughter’s 3rd birthday. The last photo of him is Annie on his lap blowing out candles. Priceless. Work is important, but invest your time, energy and money in what has lasting value. Gosh I needed this one at 18. If I would have saved then like I am now, I could be retired by 40 (I’m not joking – I’ve done the math). There is no good reason a recent graduate needs to live in a good neighborhood, drive a nice car and have all new stuff. Be cheap for the first five years after you graduate from college and it can make literally millions of dollars’ worth of difference. Learn How to Plan for Retirement – and Actually Do It! Don’t know what a 401k is? Clueless about the difference in a Roth and Traditional IRA? Head spin when I mention the term aggressive growth mutual fund? Shame on you. If you will endure the pain of learning how these things work and then develop a plan for your retirement, you will be financially able to retire earlier, be secure in your financial plan, and avoid being duped by the scoundrels out there who want to hock their latest financial “opportunity” on you. This doesn’t mean “go crazy and get arrested.” This means do things that are a little scary but will stretch you a bit. Learn new things, meet new people, go new places. Say “yes” to opportunities that you won’t get later. God didn’t make us all the same. He gave us unique personalities, viewpoints and perspectives so we would be able to think for ourselves. Apparently in Washington DC there is some device that vaporizes this portion of the human brain. Unless you want to act like the people who run our country, form your own opinions! Be able to defend those opinions and force someone who wants to challenge you to be able to defend their opinions too! There is too much rhetoric and not enough intelligence in our world. Well, that’s my Top 10. I could have probably come up with at least ten times that many, but I thought I’d leave some for you. 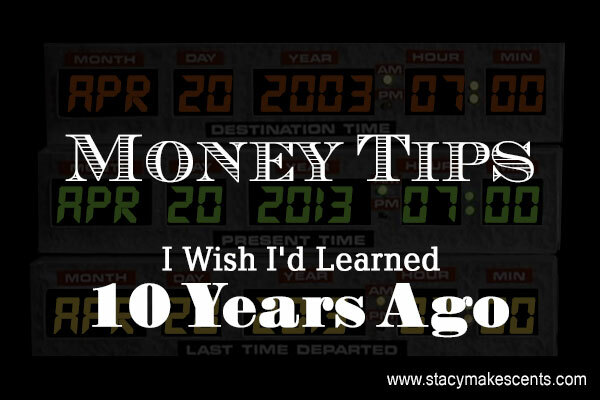 What are some of the money tips you wish someone would have told you ten years ago? Great tips! However, I don’t believe everyone is called to save for retirement. This is where the unique personality and calling comes in. I know this goes against popular opinion and even wisdom for most, but we have to follow God’s leading as individuals. I also don’t believe everyone is supposed to own a house. Hey Angela, thanks for your response. I whole-heartedly agree that many should never own a house. There is no shame in renting! But I wonder why you would say some shouldn’t save for retirement – what happens when they reach an age where work is no longer possible? What happens if/when they are disabled? I can’t see an instance where someone should not save for retirement if there is any possible financial way to do so. Help me understand where your point is coming from. Thanks for this sentiment, Cheryl. I hope she learns from me (and you, because I assigned her to read this post) and takes the information into her future. “You manage what you measure” – I LOVE THAT! One thing my mom taught me that I’ve found to be true, is if it’s a decision that MUST be made now (ie the offer expires as soon as you hang up the phone) it’s automatically a really bad decision. Just say no, because they know if you really stop to think about it, you’d never do it. I love the common sense comment 🙂 so true!! Haha. I also love this post. I would just add discipline!!! In any form. I’m pretty sure my parents tried to drill all of this into my head when I WAS 18. I just didn’t listen. with our kids growing so fast and time slipping away from us (now that we realize it) how can we make this stick in our kids head!? The one thing I do remember my dad constantly telling me that I didn’t listen to but wish I would have was how fast time flies. “before ya know it, you’ll be out of college searching for a great job. Two years is not nearly as long as you think. So stick to it. It will soon be a thing of the past.” ya ya whatever dad. Two years is a fricken eternity. And now I’m 30! I really didn’t have enough discipline to stick out my 2years??? DOH!!! At 32 (almost 33), I can already see the clock speeding up. “Eternity” doesn’t seem to be nearly as long as it used to be just a few years ago. Credit cards are NOT your friends!!! What a great list! I would add: Wait 24 (or 48!) hours before making any purchase greater than $X…then determine what “X” is. It was amazing to me over the years how spending $200 got as comfrortable as spending $20 once my income began going up. Its a trap. Once I began a “waiting period” I realized how impulsive my spending could be. Barry, this is one of your best columns. I read yours and Stacy’s blogs on a regular basis and value all the information that you give us. Sometimes a little common sense is all that is needed and this one is full of good, old-fashioned common sense. Thanks, Janie. That made me smile. These are great life tips, not just great money tips. Hear, hear! I know some of those people – thankfully I’ve always been really cautious and so I haven’t gotten sucked in to those schemes. Hhmmm….. I am one of “those people” who chose to build a wonderful life for myself and three children when I became a single mom. The original “scheme” was Mary Kay Cosmetics. Mary Kay (whom I have met several times) was a devout Christian who made no excuses for her company’s foundation: ‘God-first, family- second and career- third’. Although I have worked in several other “schemes”, I have always held Mary Kay’s original foundation in place throughout my entire career (25 years -now retired). Yes, there ARE poor companies out there where the almighty dollar reigns and greed is at the heart of their business. However, character/integrity is what separates them. It isn’t always the company at fault, either. The individual representatives are responsible for the manner in which they choose to run their lives/business. We must not paint every company /individual with the same brush, true? Absolutely! Every company has a “scheme” of some sort to selling their products. There are several that are worthwhile and several more that are not. Without making a list, I can attest that I know Mary Kay is a legitimate and reasonable BUSINESS. The point another reader made (and to which I totally agree with) is that there are lots of these multi-level deals and programs out there designed to make a few very successful and the majority that buy into it are taken advantage of. Happens all the time. But to be clear – you’re right – there are also lots of real, legitimate businesses that use independent consultants to make up their sales force. For some, it truly does work. The integrity of the business owners/operators determines which category it falls into. Ha! Daphne responded to the comment as well praising Mary Kay and that was my response to her. These threaded comments confuse me sometimes. Love this post. I’ll add pray about EVERY financial decision you make. Also, be generous with your excess. When my husband and I were first married we made double what we do now because I was working, but didn’t give beyond a 10% tithe most of the time. While we were saving and being very responsible with our money, we were always too afraid to part with our precious money and give it, in case we’d need it in the future. When I think about how many people we could have helped with double the income we make now and yet we didn’t it grieves my heart. Prayer-based generosity – great addition to the list! Thanks!